Uses: as a source of nitrate. Niter is one of the few nitrate minerals that is available on the mineral markets. Nitrates are not all that commonly found due to their general ease in dissolving in water. In fact some solid nitrate crystals will even become liquid by removing water from the moisture in the air, a process called deliquescence. Niter however is not deliquescent, but still is very soluble in water. Most nitrates are found in arid, desert regions such as around the Persian Gulf or found as efflorescences on dry cave or mine walls. Nitrates are similar to carbonates. The nitrogen is surrounded by three oxygens and forms a tight flat triangular NO3 ion group just like the carbonate triangular CO3 ion group. Thus nitrates are placed in the Carbonate Class of minerals. But there are some differences. The nitrogen has a higher charge (+5) and is smaller than the carbon (+4) and thus the nitrogen holds the oxygens a lot closer and the nitrogen oxygen bonds are stronger. Also the overall charge of the nitrate ion group is only negative one (-1) compared to the carbonate's ion group's charge of negative two (-2). These differences show up in a greater difficulty in breaking apart the nitrate ion group as is usually an easy task for acids with the carbonate ion group, greater solubility and a much less diverse subclass of minerals. Niter is most similar to the orthorhombic carbonates or those carbonates that belong to the Aragonite Group, specifically aragonite, witherite, strontianite and cerussite. The structures of niter and the members of the Aragonite Group are analogous and they therefore share many similar properties such as symmetry and crystal habits. Another nitrate called nitratine, NaNO3 (also known as "soda niter") is structurally more similar to the Calcite Group of carbonate minerals. Nitratine in appearance is similar to niter but is deliquescent and gives a different result in a flame test. The flame test is where a sample is burned in a flame and gives off a certain color. For niter the flame should be violet, an indicator of potassium, and for nitratine the flame should be yellow, an indicator of sodium. Niter, specifically KNO3, is also known as "saltpeter" which is said to reduce the sexual desire in humans, especially males. Kind of a reverse aphrodisiac. Ironically, it is also used as a fertilizer. Color is white or gray, also tinted yellow or brown by impurities. Transparency Crystals are translucent to transparent only in individual crystals. Crystal Habits include crusts and acicular crystals formed as efflorescence on cave and mine walls. Also as a constituent in arid climate soils. Rarely forms crystals of any appreciable size but some clusters of hexagonal shaped twinned crystals are known. Cleavage is good in two directions (prismatic). Other Characteristics: Easily soluble in water, gives a violet flame in a flame test (potassium), is slightly sectile and is nondeliquescent. 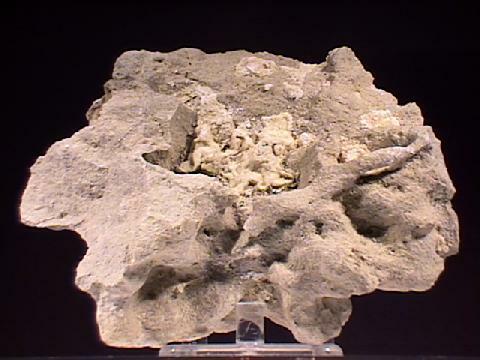 Associated Minerals calcite, dolomite and certain minerals in various arid region soils. Notable Occurrences include the Persian Gulf states, India; Russia; Italy; Spain; northern Chile; New Mexico, Kentucky and Tennessee, USA; Egypt and Bolivia. Best Field Indicators are crystal habit if visible, solubility in water, nondeliquescent and violet flame test.